Although others disagree this game is known in other circles as Another Formula One: Built To Win and Taito License may be a different series but it is essentially the same type of game. So if you enjoyed Formula One: Built To Win then you will love this game as well. 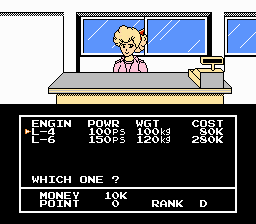 Though similar, Taito License and Built to Win are different titles. But it’s still like another version of the same type of game as Formula One: Built To Win. So you can reject the idea but the game is what it is. 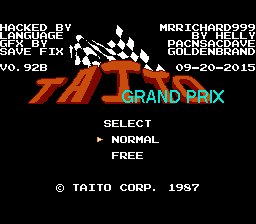 Here is a full translation for Taito Grand Prix - Eikou e no License for the NES. 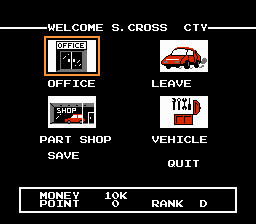 This game is much like Rad Racer but you race for rank points, cash for purchasing upgrades, and acquire new cars. You can race a Mini Cooper, a Ferarri BB512, and a Formula 1 race car. As you progress in the game you go from regular races to Grand Prix & World Tournament racing. 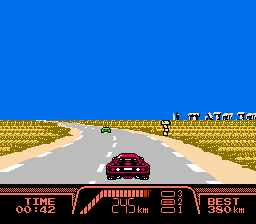 If you are a fan of Rad Racer, this is a game you must try! v091b Update - Saving feature has been corrected thanks to Goldenband. v092b Update - Thanks to Pluvius where a bug fix was made when using NOS & body kits after purchasing were unusable prior. 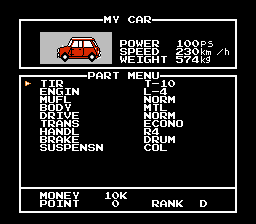 Pluvius Hacking Fixed a bug where NOS/Body Kits were unusable after purchasing.